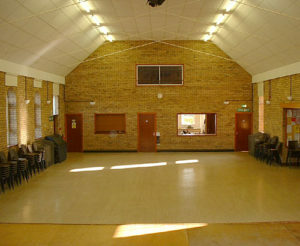 Main Hall – the large main hall can be used on its own or with the stage facilities. Separate Kitchen & Bar Space – shutters at the end of the main hall provide access to a well-equipped kitchen and a counter area suitable for an imported bar. 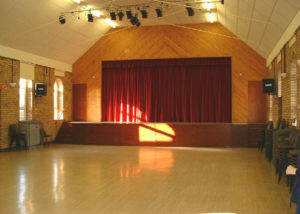 Traditional Stage – located at the end of the main hall with lighting and audio facilities available and two backstage dressing rooms. Audio Visual Facilities – Since 2013 the main hall has a projector and screen, which can be used with a hirer’s laptop. Music may be played using an audio system that allows connection of an MP3 player, iPad, cd player, etc. A sound mixer unit is available, this can also provide conference facilities using up to six microphones. An induction loop system is also installed. 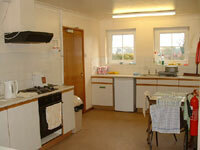 There is an additional charge for the use of some of these facilities. Wi-Fi – Free Wi-Fi is available (a password obtainable from the Booking Officer is required). Humphrey Back Room – a small upstairs meeting room. Car Park – free car parking space for 80 cars. Main Hall: Seating only (theatre style) 190. 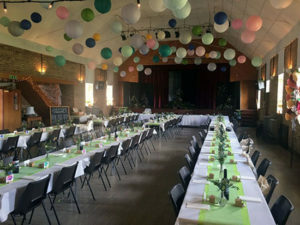 Main Hall: Seated at Tables (cafe style) 110. The premises licence for the hall permits theatre, music and dance events with use up to 23.30 hours Monday – Thursday, 24:00 Friday and Saturday, 23:00 Sunday. The hall also has a Performing Rights Society Licence, which permits the use of copyright music both live and recorded. For events with a bar it is necessary for the hirer to obtain first the agreement of the booking officer and then a Temporary Events Notice from South Norfolk Council. The Secretary and the Booking Officer hold copies of the Premises Licence for the hall.